School is a walk in the park; just ask students enrolled in the Heavy Equipment Repair and Operations Program (HERO) at Oswego County BOCES. 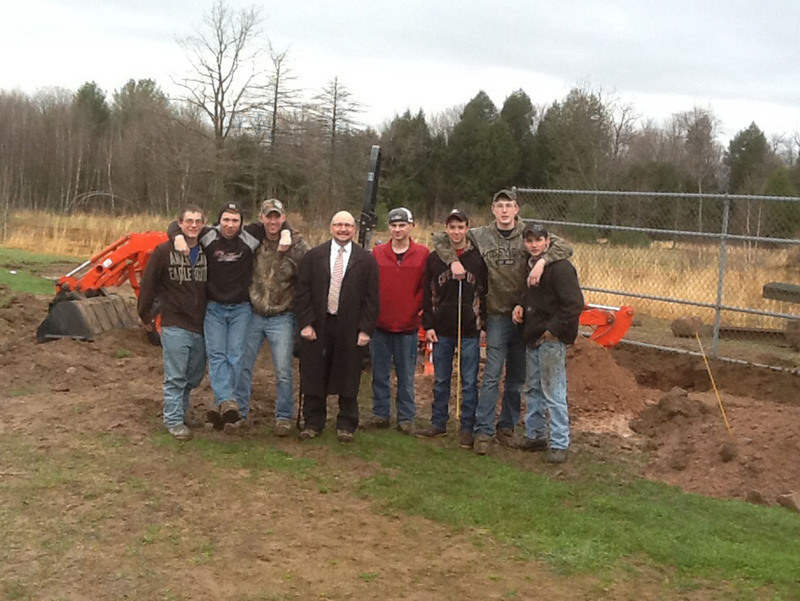 Oswego County BOCES Heavy Equipment Repair and Operations students and OCB District Superintendent Christopher Todd during a baseball diamond refurbish project at A. A. Cole Elementary School. From left are: Robert Strong, Garret Lewin, Nicholas Bell, Superintendent Todd, Dan Sigle, Ed Lauricella, Andrew Dashnaw, and Cullynn Morley. The six HERO students are all from the Central Square Central School District and the project gave them an opportunity to give back to their school district’s community. HERO students recently finished a project that took them out of their classroom and on the job site at A.A. Cole Elementary School in the Central Square Central School District. The students, in cooperation with the North Shore Junior Baseball League, refurbished the baseball diamond located adjacent to the school. Students moved two backstop fences and benches, graded out a ridge along the edge of the property, redid the baselines, and landscaped the area. HERO Instructor John DeSantis said that the project only took four class days complete and gave students valuable on-site work experience. In addition, the project gave students an opportunity to give back to their community as a majority of the students who worked on the project were from the Central Square Central School District.